The world of Linux customization is a complicated and fragmented one. There’s so much variety, but also a lot of, frankly, suboptimal themes out there. No GNOME themes, no mac look-alikes: these are truly the greatest-looking and better-made Unity themes, at least in my humble opinion. 1. Orta – It’s a great-looking theme that mixes shades of gray with really bright colors. Professional would be the first world that would come to mind when talking about this theme, because that’s exactly what it is: nice lines, prominent window buttons and a gray color scheme. The window button placement on the left might turn a few off, but that’s a small price to pay for such a good-looking theme. 2. Elementary – This theme is pretty popular among the Linux community, and for a good reason: it’s really nice-looking. Just like the one we mentioned before, this theme looks professional, except instead of shades of gray, we’re presented with a silver theme, with a silver-colored windows and a black menu bar (although there’s a silver option as well). As with the previous theme, the main drawback is probably the placement of the window buttons. It also doesn’t have the extensive icon set that can be found on other themes, but other than that, you can’t go wrong with this popular and great-looking theme. 3. Minty Freshness – If all of these themes have too much of a gray color scheme, you’ll likely enjoy this one more. Minty Freshness has a silver look with a touch of green: green window button, green icons and many other elements scattered around the system, including context menus. A major problem I found with the theme was the fact it breaks Google Chrome’s title bar. While that has no impact on usability, you’re advised to disable system windows (by going into Wrench > Preferences > Personal Stuff and checking “Hide system title bar and use compact borders“). In order to install it, please download this PPA and select Minty Freshness. 4. Equinox – If you’re looking for a theme with the window buttons placed on the right, this is probably the best choice for you. Aside from a great-looking and comprehensive icon pack, this theme has a great color scheme based on blacks and shades of dark gray. It comes in various flavors, including a darker one, but they all share the same icon pack, and essentially the same look. 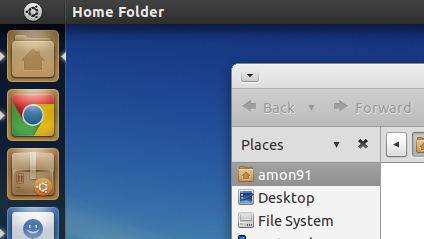 Those are my four picks for the best Ubuntu themes. If you’re just getting started with customizing Linux, these four themes could be a great way to start. We’ll keep you posted if we find any other great-looking theme.